This is not the first major aggression projected by the Shia group against their northern neighbors. Since 2014 there has been a wide range of attacks, including an intercepted missile near Mecca. Yemen’s Houthi rebels have been accused of targeting Saudi Arabia’s holy city of Mecca by launching a long-range ballistic missile from 500 km over the border, while they responded by saying that Jeddah was the actual target. While Saudis have not confirmed the Riyadh attack, there is no doubt that the Houthis have Scud-based ballistic capabilities. The Al-Madinah warship of the Royal Saudi Navy was in late January hit by a Houthi boat attack off the Yemeni port of Hodeidah, killing two crew members. The warship returned early Sunday to the King Faisal Naval Base in Jeddah. In response, the United States Navy has dispatched the USS Cole to protect the waterways of the Red Sea, Bab Al-Mandab strait and the Gulf of Aden, after the Houthi attack. Last October, the U.S. military launched cruise missile strikes to knock out three coastal radars located in areas of Yemen controlled by Houthi forces, retaliating after failed missile attacks on another U.S. destroyer, the USS Mason. 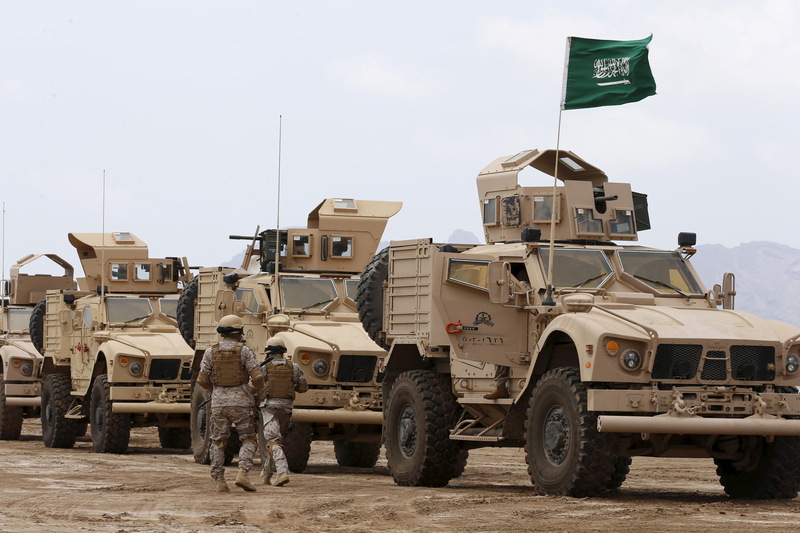 Saudi Arabia has been leading a military intervention against the Houthi insurgents that overthrew the Saudi-supported Hadi government, since early 2015. 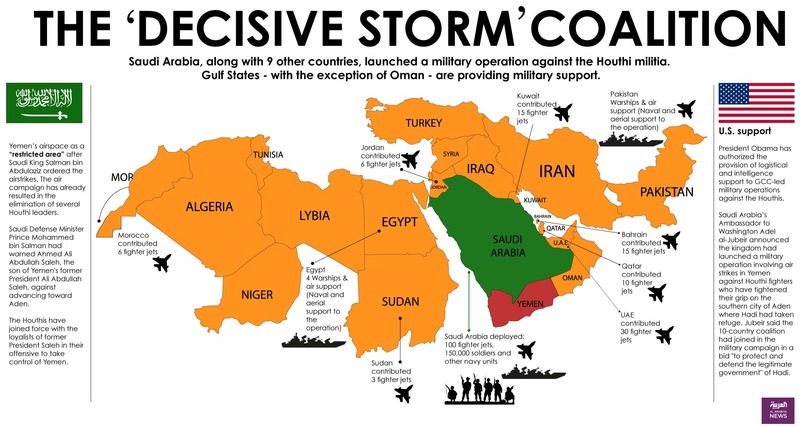 The Kingdom-led Coalition initiated Operation “Decisive Storm” encompassing other Middle Eastern countries including Egypt, Morocco, Jordan, Sudan, the United Arab Emirates, Kuwait, Qatar and Bahrain. Djibouti, Eritrea and Somalia made their airspace, territorial waters and military bases available to the coalition. The United States provided intelligence and logistical support, including aerial refueling and search-and-rescue for downed coalition pilots. The military effort involved not only air strikes but also ground troops, marking the debut in action of many Gulf countries, as the UAE, Saudi Arabia and Qatar. On 21 April 2015, the Saudi Defence Ministry declared it was ending the campaign of airstrikes because it had “successfully eliminated the threat” to its security posed by Houthi ballistic and heavy weaponry. It announced the start of a new phase codenamed Operation “Restoring Hope”. The air strikes did not cease and their targeting worsened after the US, as other states stepped aside from the Coalition. Although the Pentagon did continue to pursue its interest in Yemen, combating the local ISIS franchise and Al-Qaeda “central” – groups that even control territory there. 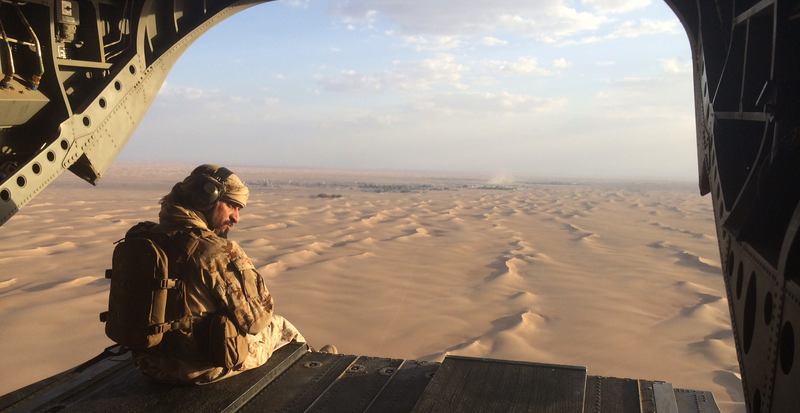 Emirati and Saudi military advisors were deployed to train local tribes and militias, while their SOF (Special Operations Forces) also conducted laser-designating ops and search & destroy missions. But with a rising Iranian involvement, including transfers of advanced weaponry to Houthis, Yemen swiftly became another geopolitical stand-off between Washington and Teheran, and a proxy conflict between the Sunnis and the Shi’a. As a consequence, the Houthis developed advanced targeting capacity, hitting Saudi Arabia several times and launching cross-border skirmishes. With the overall security state of Yemen dramatically polarized and fully imploded jihadi groups as ISIS and Al-Qaeda extended their reach over turf and territory. Yemen is one of the seven countries flagged by the Obama administration as “countries of concern” in 2015 by passing the Visa Waiver Program Improvement and Terrorist Travel Prevention, after the November 2015 terrorist attacks in Paris. Yemen, as the other states on that list, was later noted by the Department of Homeland Security of lacking a central authority or government needed corroborate information and data on their departing citizens. In consequence, US President Donald Trump issued an executive order instating an immigration and refugee ban on these seven countries, including Yemen, for 90 days, respectively 120 days. So far, more than 10,000 Yemenis have since been killed, most of them civilians, according to official UN figures, while some 3 million have been forced into displacement. Meanwhile, at least 113 Saudis have been killed in skirmishes or rocket strikes along the border with Yemen since the coalition campaign began. (1) The transfer of Iran’s advanced ballistic weaponry, under the disguise of “humanitarian aid”, to paramilitary groups as the Houthis, confirms that Teheran attempts to replicate the “Hezbollah model” of upgrading a traditional guerilla group to superior hybrid nature. This deepens the sectarian rift undergoing in the Middle East and stirs more turmoil in the US ally’s backyard; Saudi Arabia as Israel. (2) The conflict in Yemen has compromised the security and control of a key strategic area and the 4rd most important oil flow chockpoint as the Bab el-Mandab strait is. These waters have been patrolled and secured through years-long effort under a NATO framework, called Operation “Ocean Shield”. Hold an international energy and economic importance. Represent a strategic transport route for NATO and the US. (3) The degradation of maritime security offers Iran the opportunity to gain a leverage in yet another global-important strait, after their sovereign control of the Hormuz strait. (4) The leadership and free engagement of military inexperienced countries as Saudi Arabia, UAE and others, has caused a humanitarian crisis through unchecked fire, poor actionable intelligence and in-discriminatory raids. Harmed the public image of the US, UK and other Euro-Atlantic allies. (5) While US already conducts SOF raids and drone strikes in Yemen, a wider comprehensive effort is needed for the US to employ more harm to Al-Qaeda, ISIS and other such groups that could craft plans, detain capabilities to launch overseas or local attacks. Should that include air and ground assets from regional allies, but under clear US guidance and actionable intelligence. Looking towards un-traditional allies as Oman (UK ally), Djibouti (which already holds a US base – USAFRICOM) as staging points would further the operational advantage. Blocking Iranian vessels from transporting more lethal goods to the Houthis. Condemning the anti-Semitic nature of the Houthis. Crafting a political roadmap that would encompass the sectarian and opposite interests. The most humanitarian response for civilian fleeing the war is the establishment of safe-zones under a strict no-fly zone authority and benefiting from armed protection.